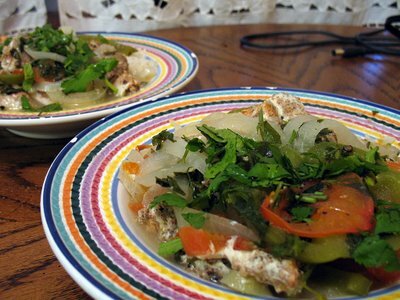 I found this variant of the Brazilian Fish Stew Moqueca on Elise’s site. Salmon is marinated in lime, garlic, and spices for a couple of hours, then cooked with onions, peppers, tomatoes, cilantro, and coconut milk. The stew is then served over rice. The only modification I made to the recipe, other than cutting it in half, was using Light Coconut Milk. This entry was posted on Monday, April 30th, 2007 at 8:26 pm	and is filed under Latin, Main Dishes. You can follow any responses to this entry through the RSS 2.0 feed. You can leave a response, or trackback from your own site.